Offering modern root canal therapy free from discomfort. The innermost layer of the tooth is known as the pulp and is where your tooth’s nerve is located. On occasion, a tooth may be become cracked or broken from trauma or decay, thus exposing the pulp. If this happens, then the pulp becomes vulnerable to infection, which can produce symptoms such as tooth sensitivity, pain, and even an abscess. If the infection is left untreated, then you would risk losing your tooth. However, our skilled dentists in Woburn MA can save your tooth using root canal therapy. With modern technology, this procedure can be completed in one visit and without any discomfort. Root canal therapy or Endodontics involves your dentist removing any infected tissue from the inside of your tooth. Once the infection has been cleared away, we disinfect the tooth and seal it with a special tooth-colored material. The remaining structure is then topped with a dental crown to protect it from further damage. Our dentists have enjoyed advanced training to provide root canal therapy to the people of Woburn and the surrounding areas. 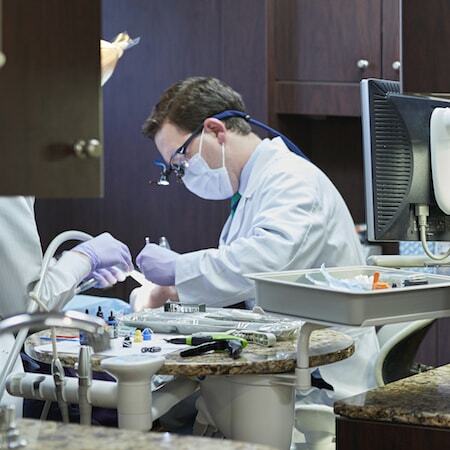 Also, our team uses microscopic dentistry during this procedure for greater visibility and enhanced results. If you feel nervous about the idea of this treatment then rest-assured our team will explain how the procedure works and answer any questions. Plus, we’ll make sure you feel comfortable before we start caring for your teeth. Wow didn't think it was possible to catch a cat nap during a root canal! Staff is super friendly and polite and always ensuring my comfort - thanks. Less chair-time and more accurate results. Dr. Trainor and Dr. Mancuso can get a magnified view of your tooth when performing a root canal. Better visibility allows us to clear out all the infection and accurately place your root canal. Our doctors can deliver better and faster care due to being able to see clearer and deliver improved results.